All of the controls can be specified and matched to your exact requirements to enhance and prolong the life of your awning and safely retract the arms when the weather may change suddenly for the worse. Most electronic controls can be added to existing installations at a later date or enhance existing installations by other manufacturers. Somfy motors power the majority of products we install and are the world leaders for quality backed up with excellent guarantees. Wind, Sun & Rain Sensors are highly practical pieces of equipment. When analysing the weather conditions and assessing whether to open or close the awning, a wind, sun & rain sensor can often prove to be your knight in shining armour on a busy day. For such a small component, this sensor can make a world of difference. Retractable Side Blinds provide the perfect solution to cold winds, low lying sun or simply to offer some discreet privacy. Mounted onto steel posts with a spring-loaded system, opening this side blind is easy – simply pull the blind from the closed position to the opposite post and attach it to the latch on the opposite post, taking approximately 5 seconds. Simple yet effective, which is what makes it so popular. 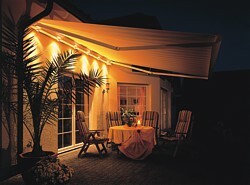 When closed, this awning is concealed by its housing against the wall giving it a neat appearance. 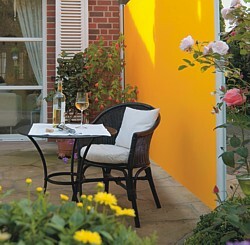 The side blinds we distribute are supplied by Markilux and Weinor. Interior Thermostats and Timer Switches give you total control of awning activity even when you’re not at home. 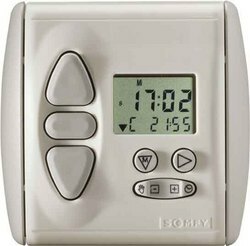 An interior thermostat can monitor temperatures inside a room and act in accordance with the awning to make sure a certain temperature is not exceeded. Timer switches control activity of the awning throughout the day whether it be opening the awning at a set time in the morning or closing the awning at a set time in the evening. These intelligent timers can be programmed in advance of up to a week and operate several awnings at a time. Remote control handsets give you the maneuverability and freedom to control your sun shading awning device from the comfort of your sun lounger, or anywhere within your home. Available in a range of different designs, a remote control handset allows you never to be caught short in a sudden rainstorm or burst of sunshine without a wind & sun sensor installed. The remote control handset systems can be used both inside and outside the house up to a total distance of over 100 metres! 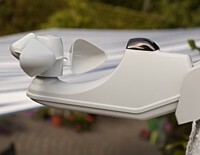 The remote can also be used to partially extend an awning to get the sun out of your eyes whilst reading on the patio, or to reduce the glare from a computer screen reflected by the sun. Ever had a family gathering or bbq which has continued into the night, only to be ruined by decreasing light or wind chill? Heating & Lighting devices offer you the opportunity to continue sitting out under your awning into the night without any of this. Lighting devices can be installed either underneath the cassette profile or on the end bar of the awning to provide effective lighting and give clear vision. Heating devices can be installed into the awning too to provide heat and eliminate cold draughts.